Today we got to share Jerry and Mary Ann Aust’s 44th wedding anniversary after church services in Mobile, Alabama. Jerry and Mary Ann were married 44 years ago in Pasadena, California. Today isn’t their actual anniversary date – it was earlier this week. But daughter Crystal and son-in-law Scott wanted to share the occasion with everyone after church services today, so Scott brought an anniversary cake to services (Crystal had to stay home with their daughter who was not feeling well, but they both got a piece of cake later). Jerry and Mary Ann have lived in numerous places in their 44 years together, and have traveled to a number of foreign countries as part of their service to the church. Jerry is a regular contributor to the "Good News" magazine. 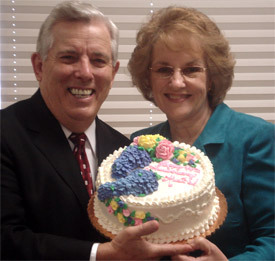 We enjoyed their anniversary cake today after Jerry’s sermon. As a matter of fact, this is the second time I have been in Mobile, Alabama in February when the Austs had an anniversary cake after services. I’ll have to plan a trip next year at this time, too. If you haven’t seen it yet, take a look at Jerry’s personal website.